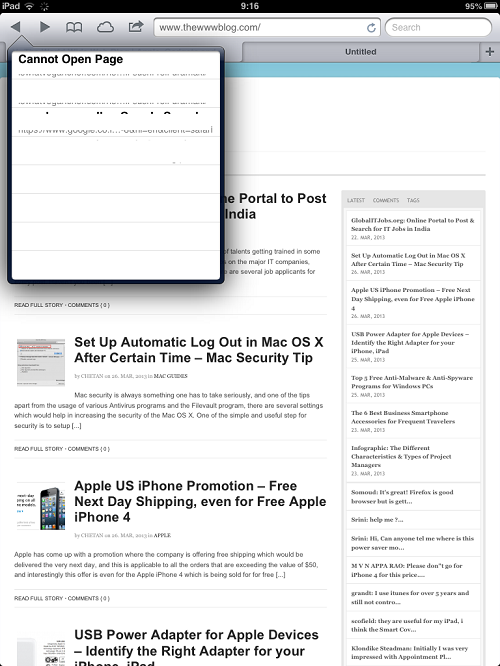 The Apple Safari browser is the default web browser for all the Apple devices, including the Apple iPad and the iPad Mini. 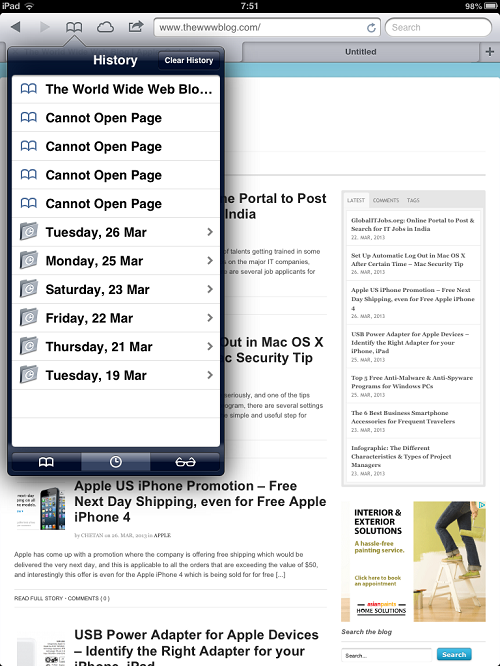 Just like every browser, the Safari browser too would keep the web hosting saved, having a list of all the pages that you browsed in the past days. To check the recent history of the single tab you are browsing, there’s a way but to check the history of the entire browser there’s another way and it is pretty easy to check and delete the history on the Apple iPad or iPad Mini. 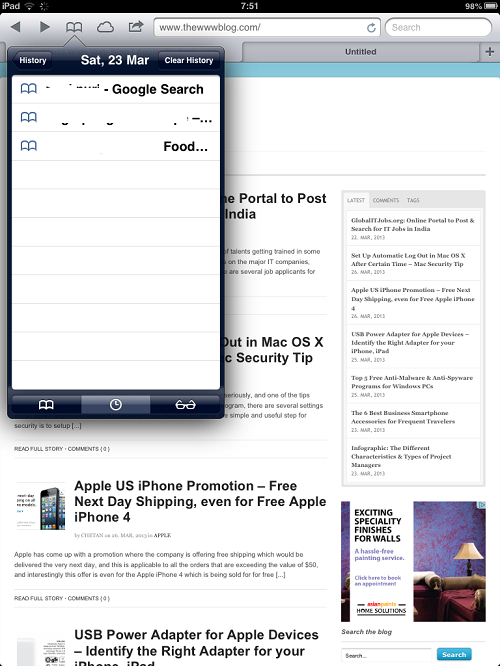 On the Safari browser in your Apple iPad, click and hold the “back” arrow mark so that a dropdown list opens showing the recently opened or browsed web pages on that particular tab on which you clicked the back button. There won’t be any options other than hitting and opening one of the pages from the history of the tab. To check the actual history of the entire browser, you need to hit the 3rd icon, the book icon beside the arrows and that would open a dropdown with icons for History and the shortcut to clear the history. Clicking on the History icon would open the day wise history of the browser. 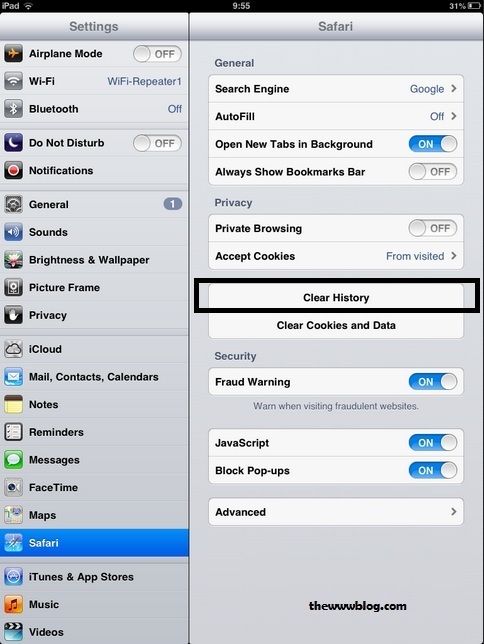 To delete the history of your Safari browser in the iPad or iPad Mini, click on Clear History button in the history tab through the browser itself, or there is another way to do that – Go to Settings > Safari in which there is an option to clear the history and to clear the cache etc. data from the browser. The tip above would not just help in checking out the browser history, but also delete specific or the entire history from the browser. You just need to swipe the particular web page listed in the history list and it would show the option for deleting that particular page instead of the entire history on one click.